The Sound Percussion Labs D2518SMG Kicker Pro 5-Piece Drum Kit is a scaled-down drum kit built to full-size standards with a loud, toneful sound. 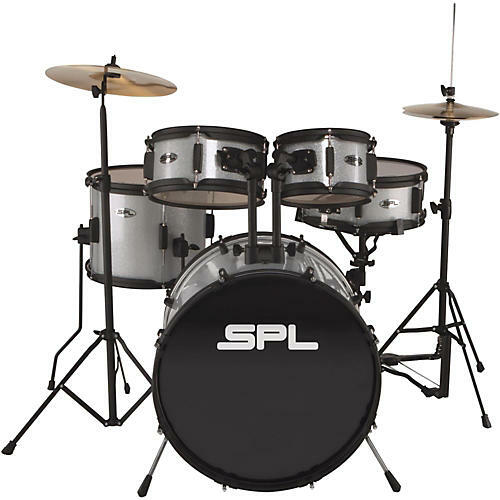 It features an 18" kick drum, real multi-ply wood shells, full-size pedals, fully tunable and replaceable top and bottom heads, and black powder-coated hardware. The configuration offers an 18" x 14" kick, 12" x 10" floor tom, 8" x 5" and 10" x 5" toms and a 12" x 5" snare drum. The pack also includes a 12" crash/ride, 10" hi-hats, a kick pedal, a drum throne and a pair of sticks (3/4-size). All hardware is included. Bass drum(s): 18" x 14"
Tom(s): 8" x 5", 10" x 5"
Floor tom(s): 12" x 10"